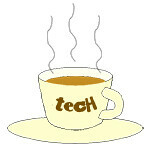 PlayBook « Tech bytes for tea? So we decided that there was a 2-week window to grab a quick break. But that’s like one-week away. Is it possible to plan the usual DIY self-drive holiday at such short notice? Aerial view of Fukuoka, our gateway to Kyushu. The answer is yes, with the advent of the Internet. Here’s a recap of what I did for my own holiday. I booked the air tickets the day we decided to go for the break, the car rental the next day, 3 hotels on the third day, and the remaining 3 on the fourth day. The remaining days were spent planning the itinerary for each stop. It’s as close to the date of departure as I’ve ever tried going on a self-planned, self-drive vacation. First the obvious, decide how long you’ve got and where you want to go. In my case, we’ve long wanted to visit Kyushu in Japan, and the window of opportunity available was roughly two weeks. If you’re thinking of visiting Japan, I recommend this site called japan-guide.com. It has comprehensive descriptions of popular tourist spots all over Japan, as well as travel tips for Japan. Even more useful is its forum where vacation planners get their queries answered in detail with advice from a community of fellow travelers, as well as useful links to resources – such as timetables, rates etc – outside of the website. Next book the air tickets. The availability and price of last-minute tickets usually determine whether your vacation destination will become a reality. For this vacation, I’m entrusting our memories to the Nikon D800, with the AF-S NIKKOR 24-70mm f/2.8G ED and the AF-S NIKKOR 70-200mm f/2.8G ED VR II lenses. That’s almost 4 kg of camera gear but for the sake of image quality, I believe the 36.3-megapixel full-frame camera and two FX lenses from Nikon are worth every ounce of their weight. Besides, we have the rental car to carry the gear between sights. For a second camera, my wife will be carrying our trusty Olympus E450 with the ZUIKO DIGITAL ED 14-42mm F3.5-5.6 kit lens. I use Zuji.com to get a feel of the airlines plying Singapore and the possible stops and the price range, then if there’s time, check competing sites or the airline’s website for better rates. For Kyushu, it was pretty straightforward, only Singapore Airlines fly directly there from Singapore – to Fukuoka. It’s straightforward until you hit the SIA website. For a premier airline, it sure has a terrible website for bookings and reservations – plenty of long waits. Next is the car rental. I use ToCoo car rental. It helps you check the rates for multiple car rental companies with cars available in the cities where you intend to pick up and drop off the car. But you’ve got to compare rates manually yourself. For computing, I’m bringing along the Lenovo ThinkPad X1 Carbon Ultrabook, a BlackBerry PlayBook, and the Seagate 1TB Backup Plus. The X1 Carbon is sleek in design, wonderfully thin and light, yet powerful enough for surfing Web and running Photoshop and Dreamweaver CS6 for photo-editing and blogging back in the hotel room. The 7-inch PlayBook keeps the children entertained with game apps, and serves as an e-book reader. Its biggest bugbear is that it’s the Wi-Fi version and does not have 3G, but I don’t use 3G data in Japan anyway. To store and back up the 40MB RAW photo files generated by the D800, I brought along the 1TB Seagate Backup Plus Portable Drive. The 2.5-inch plug-and-play drive constantly backs up the hard disk and makes posting photos online a breeze. Usually, I pick up the car at the airport, drive off to the first destination and return the car at the airport I’m flying off from. If the pick-up and drop-off locations are different, check if a surcharge is levied and how much it is. For music in the hotel room, we’re bringing along the Jabra Solemate portable speaker. Instead of lugging stacks of CDs around, simply download your favourite tracks onto an SD card and plug it into the Solemate. What I like most is we can play our song collections and playlists wirelessly from our smartphones, tablet and Ultrabook via Bluetooth. It’s portable, easy to use and the sound quality is superb. Finally, book the hotels. I know some Japanese so I used to browse Japanese booking websites and hotel websites directly, calling them on the phone for enquiries and reservations. This time round, I discovered that my favourite accomodation-booking website for Europe holidays – booking.com – now has quite extensive list of hotels in Japan. Enough to find hotels that fit your budget in most places in Japan. I like booking.com because of its clear information and easy booking. So even if you don’t know ANY japanese, you can still find and book accommodation easily. We don’t use smartphones an awful lot, but for the record, we’re bringing along the Android Sony Xperia ion and an aging iPhone 3GS. I’ve left the Nokia Lumia 900 at home because Nokia maps does not have the navigation map for Japan, and I’m renting an English GPS with the car anyway. Another website that I tried last year – hotels.com – seems to be only beginning to move into Japan, with poor selection and high prices. I’m hoping there coverage and pricing will improve over time. Once you’ve gotten the flight, car and hotel bookings out of the way, what remains is the physical packing for the big day. RIM has announced the details to two initiatives to attract developers to the BlackBerry 10 platform: the US$10k Developer Commitment initiative and Built for BlackBerry initiatives. RIM BlackBerry 10 US$10K Developer Commitment. First announced during BlackBerry 10 Jam Singapore, the US$10,000 Developer Commitment initiative is offered to developers that meet the following criteria. Developers must certify their apps through the Built for BlackBerry program and submit them prior to the launch of BlackBerry 10. RIM Built for BlackBerry developer initiative. Over the period of 12 months from launch of BlackBerry 10, if the app earns at least US$1,000 on its own but less than US$10,000, RIM will pay the developer the difference between the revenue earned and US$10,000. Developers are only eligible to receive this one time. In the event where the app earns less than US$1,000 or more than US$10,000, the app is not qualified to be part of the program. The Built for BlackBerry program will be initiated this September and allow developers to submit their BlackBerry 10 apps for third-party review. From productivity apps to lifestyle apps to games, developers will be able to submit their BlackBerry 10 WebWorks or BlackBerry 10 Native app to the Built for BlackBerry program, and when cleared through the review, will receive the “Built for BlackBerry” quality status. The “Built for BlackBerry” designation will convey to customers the added level of evaluation an app has gone through and that it meets RIM’s high standards for quality and performance.Developers will be able to display this title on their website, on the BlackBerry App World storefront, and anywhere else they market their apps.It is a means for professional developers to differentiate their apps on BlackBerry App World. The program will be free for now. RIM has unveiled the new 4G LTE PlayBook. Available in Canada on 9 August with 32GB and a more powerful 1.5GHz dual-core CPU. Prices TBA. The new PlayBook comes with much needed cellular connectivity. 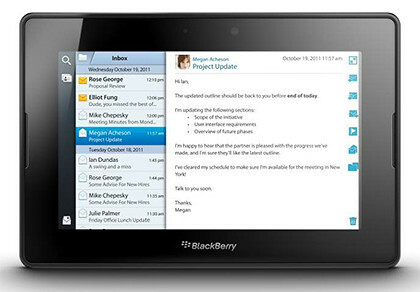 The 4G LTE version of the BlackBerry PlayBook will make its debut in Canada next Thursday, with availability in other countries in the following months. Given the incompatibility of 4G networks in different countries, it could be some time before a version compatible with your country becomes available. In the meantime, the new PlayBook will at least bring much needed cellular connectivity (on 3G) for users from countries which do not have a 4G network yet (or who have incompatible networks). 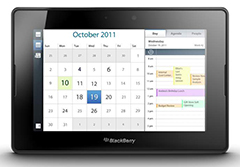 Available in Canada on 9 Aug.
Research In Motion (RIM) had announced earlier that the PlayBook will eventually run on BlackBerry 10 OS. So the 4G LTE should be upgradeable from the current BlackBerry Tablet OS when BB10 becomes available next year. Apart from the 4G LTE connectivity and CPU speed-up, the hardware for the new PlayBook remains the same – which is a testimony of how advanced it was to begin with when the original PlayBook was launched last year. Since the London 2012 Olympics is just next week, here are some free BlackBerry apps to stay in tune with the Games. Weekend diversion: Download some free BlackBerry apps for the London 2012 Olympics. The London 2012 Olympics will be from 27 July to 12 August. The Opening Ceremony will be on Friday (27 July). If you’re using a BlackBerry, here are some free apps to welcome the games. Click the thumbnail to get to the apps page on BlackBerry App World. Before the Olympic Torch arrives in London for the 2012 Summer Olympics, download the London 2012: Official Join In App for the Olympic and Paralympic Games – your pocket guide to the activities on your BlackBerry smartphone. Feeling inspired by the athletes? Endomondo Sports Tracker is your free personal coach and training partner. Check out the latest news, analysis or tweets by your favorite sports teams with FanFeedr Personal sports news. Lastly, don’t leave your PlayBook out in the games- go race some gazelles on Wild Olympics Athletics. The BlackBerry 10 Jam World Tour rolled into town today as more than 300 developers from Singapore and surrounding countries packed the Grand Ballroom at Hilton Hotel to be briefed on why they should develop apps on BlackBerry 10. Wvygen Wong (right), local developer, talk about the BlackBerry 10 experience. To his right is Justin Lee, Application Development Consultant, Developer Relations, APAC, RIM. “We are fully committed to BlackBerry 10,” says Charles Dufourcq, Director for Singapore at Research In Motion (RIM). And that is the message that RIM wants to get through to developers. “Research In Motion customers from GoDaddy Group Inc. to asset manager Thames River Capital UK Ltd. are preparing for the worst: the loss of the BlackBerry service their employees depend on to communicate. RIM’s stock has slumped more than 70 percent in the past year, and tumbled 19 percent on June 29 after the company posted a quarterly loss and delayed the BlackBerry 10 operating system, increasing the pressure on RIM to find a buyer or sell assets. – “RIM’s Customers Working on Contingency Plans: Corporate Canada” dated 9 July (today) on Bloomberg, by Scott Moritz and Olga Kharif. The rollout of BlackBerry 10 has been further pushed back to the first quarter of next year. Developers need to be convinced that BlackBerry 10 will come into being if they are to be persuaded to invest time and effort into developing on the new platform. I believe Dufourcq when he says RIM is committed to BlackBerry 10. But it is not a secret that RIM may not even be in its current form after it considers the findings of an evaluation study of its strategic options by JP Morgan and RBC, which includes – as a least favoured option – a sale of the company. It is anybody’s guess how a re-structured/acquired RIM positions BlackBerry 10. But let’s not speculate too much. The full-day BlackBerry 10 Jam today aims to provide the developer community with insights on the BlackBerry 10 platform. “We are fully committed to BlackBerry 10,” says Charles Dufourcq, Director for Singapore at RIM.To help developers get started on the BlackBerry 10 platform, attendees were provided with a BlackBerry 10 Dev Alpha device in order to test their apps and to help ensure their apps are ready and available for customers. 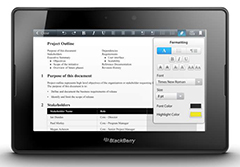 Applications created with any of the BlackBerry 10 tools will run on BlackBerry 10 smartphones as well as BlackBerry PlayBook tablets when the new platform becomes available for the PlayBook. 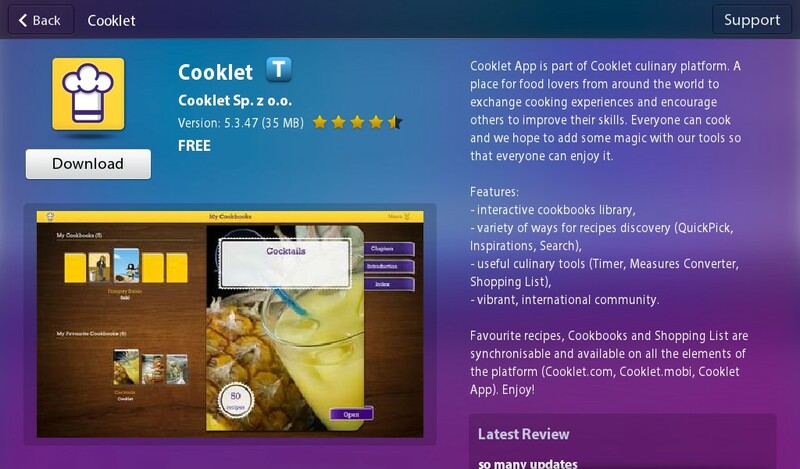 The free Cooklet app was released on BlackBerry App World on Wednesday, 4 April. I downloaded the 35MB app for my wife who has tried it over the long weekend. The free Cooklet app can be found in App World on the BlackBerry PlayBook. Cooklet App is part of the Cooklet culinary platform, which includes their Facebook page and website which offers recipes, cooking-related utilities. “I find Multitimer and Converter very useful. I used to use a separate timer, either a mechanical one or my smartphone for timing, and Google for units conversion. Now I can do all that on my PlayBook” – Chef-at-large of the Tan family.Favourite recipes, Cookbooks and Shopping List can be synchronised and are available on all the elements of the platform (Cooklet.com, Cooklet.mobi, Cooklet App). Cooklet aspires to build a community for food lovers from around the world to exchange cooking experiences and encourage others to improve their skills. Installation was easy and fast. Go into App World on the PlayBook, do a search for Cooklet, click the Download button. The app's home screen offers various ways of looking up recipes. Once the app is downloaded and installed, you’re good to go. 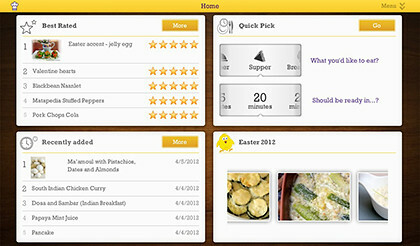 The home screen of the app comprises four panes, offering different ways to search for recipes: based on ratings, recently added, picture thumbnails based on a them (eg Easter 2012) and Quick Pick search based on which meal you want to prepare for and how much time you have to prepare the meal. 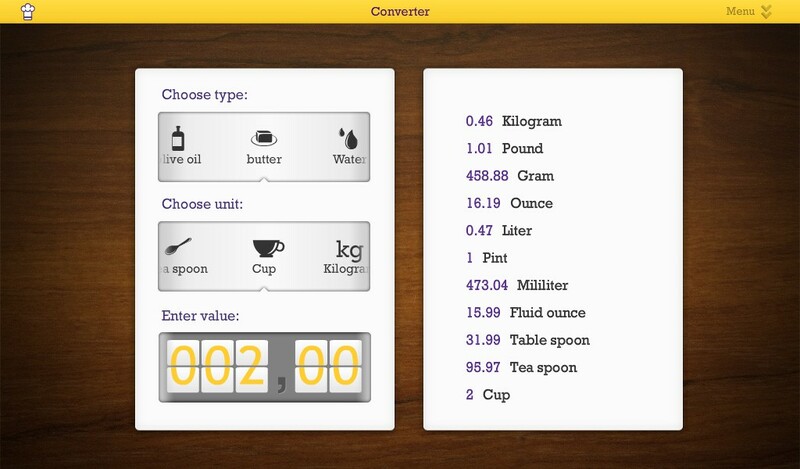 The Converter tool is very useful when perusing the recipes. Swiping downwards from the top edge of the PlayBook reveals the options for the app. 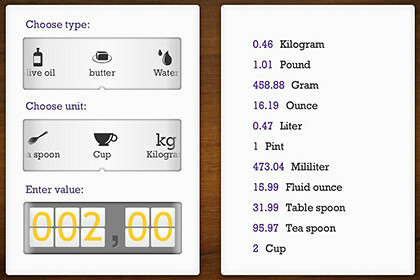 Amongst these are tools such as “Multitimer”, units “Converter”, and “Shopping List”. 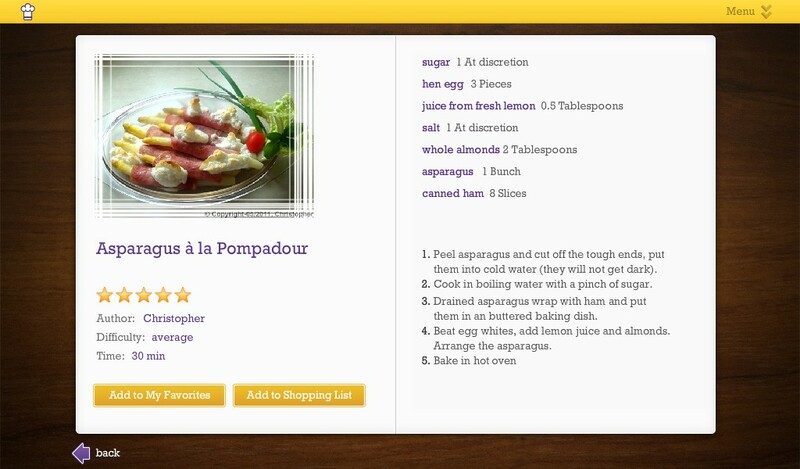 From any recipe, you can send the ingredients to the shopping list with the click of a button. There is a large repository of recipes available. There is also the traditional keyword search for recipes. 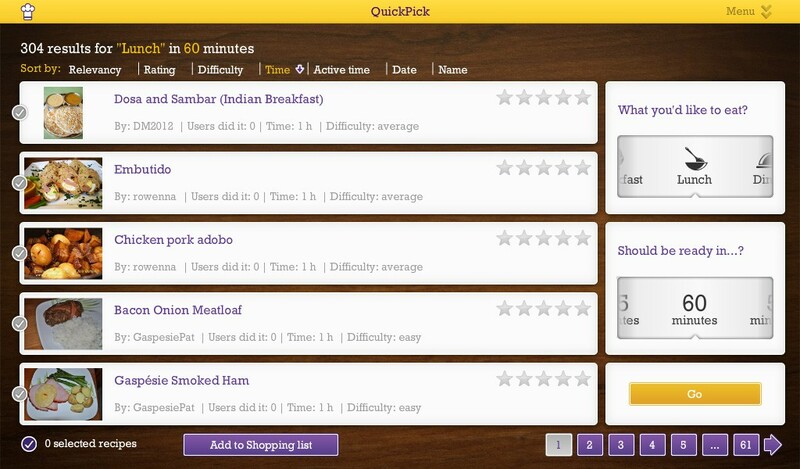 Results can be sorted by Relevancy, Rating, Difficulty, Time needed etc. For those with a free user account with Cooklet.com, you can access saved recipes from “My Cookbooks” after logging in. 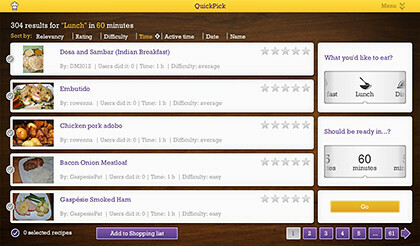 Quick Pick search makes it easy to find the right dish for any meal. The recipe has a large collection, and the various ways of searching/browsing for recipes makes it easy to look for an appropriate dish for any occasion. Just a word of caution though, keep the PlayBook well clear of all the flour and raw materials, as well as the oven, unless “PlayBook Cordon Bleu Au Gratin” is part of the menu. The free Zinio app was released on BlackBerry App World on Tuesday, 20 March. 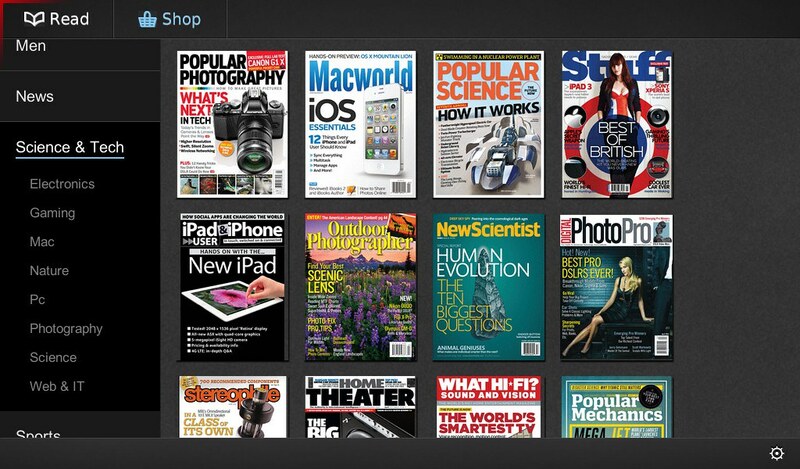 I’ve tried it out for the past few days to read the two free magazines that came with the “magazine stand” app. 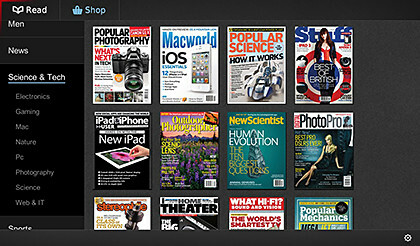 Zinio stocks over 5,000 titles in more than 30 languages. Installation was easy and fuss-free. 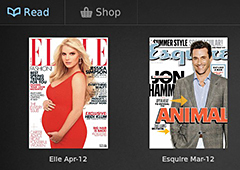 Fire up App World on the PlayBook, search for Zinio, click the Download button. The 1.8 MB app is downloaded and installed in a jiffy (depending on your bandwidth) and you’re set to go. 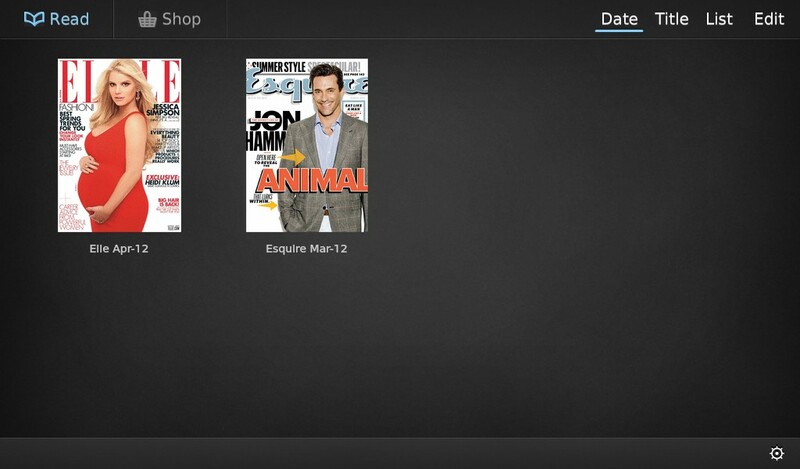 Zinio starts you off with two free magazines when you first install the app. Starting up Zinio, you’re prompted to sign in if you have an existing account with Zinio (which is also available through a browser and via apps for iOS and Android tablets), or sign up for a new account. All you need to sign up is an email and a password. Once logged in, you remain logged in on the PlayBook until you log out. Once in, you get to the library with two free magazines for installing the app. At this point, you get the March 12 issue of Esquire and April 12 issue of Elle. Click on the thumbnail to download the magazine. 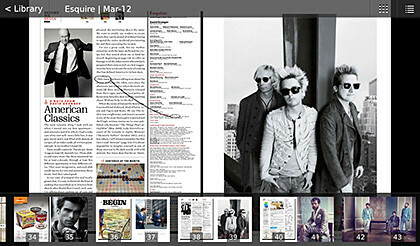 Once downloaded, you can read the magazine even when offline. View two pages at a time in landscape mode, with navigation interface when you tap on the screen. The user interface is simple and intuitive. In portrait mode, you view one page at a time. In landscape mode, you view two pages on the screen. Pinch to zoom out and spread the fingers to zoom in. View one page at a time when in portrait mode. Shown with navigation thumbnails below and options above. Double-tap to zoom-in quickly and single tap to display options, such as a row of scrollable thumbnail pages at the bottom for quick navigation. Navigation was easy and smooth and the app has been stable in the few days that I’ve played with it. Want more magazines? Hit the online shop. 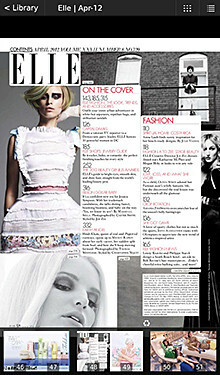 The categories are listed to the left, and the magazine covers in the category listed to the right. Selecting a magazine will bring you to the details page where you can choose to purchase either a single issue or subscribe for a number of issues. After that, it’s the typical payment transactions, with entry and verification of credit card details. Zinio has more than 5,000 titles (magazines and newspapers) in more than 30 languages from around the world. Publications purchased or subscribed to can be perused on any compatible device as long as the user is logged in with the account used to make the purchase, and a version of the magazine compatible for the OS is available on Zinio. 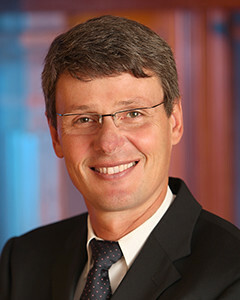 BlackBerry maker – Research In Motion (RIM) – has named Thorsten Heins as President and CEO of the company. Mike Lazaridis remains Vice Chair of the Board while Jim Balsillie takes on a Director role at the company. This is effective immediately. Heins was also appointed to RIM’s Board. He joined RIM from Siemens Communications Group in December 2007 as Senior Vice President for Hardware Engineering and became Chief Operating Officer for Product and Sales in August 2011. I believe Heins does not have time on his side, given BlackBerry’s rapid loss of market share to rival Android devices and Apple iOS products. “We have a strong balance sheet with approximately $1.5 billion in cash at the end of the last quarter and negligible debt. We reported revenue of $5.2 billion in our last quarter, up 24% from the prior quarter, and a 35% year-to-year increase in the BlackBerry subscriber base, which is now over 75 million.” – Thorsten Heins, new President and CEO of RIM.RIM’s market share of smartphones in the US declined from a market leading 44% in 2009 to 10% in 2011, according to market researcher NPD Group. BlackBerry has been growing outside of America but it is facing similar challenges from its competitors in those markets as well. Coming from within RIM instead of outside, the natural question will be whether Heins will be doling out “more of the same” at RIM. I’m not sure having been in RIM since 2007 is necessarily something that will be seen as positive for Heins. Investors will be keen to know if he had his own ideas but could not act on them because he was not the CEO. Heins will have a very short time to show how different he is from his predecessors, that he has his own vision and roadmap to bring RIM back to its previous success. I’m hoping his “I don’t think that there is a drastic change needed” spiel during his first press conference as CEO is merely paying due respect to his predecessors. 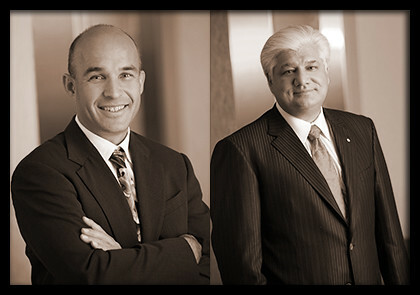 The succession plan was submitted by the two Co-Chairs and co-CEOs, Mike Lazaridis and Jim Balsillie. RIM’s Board of Directors acted on their recommendations after conducting its own own due diligence. Investors had forced RIM to consider a change in company leadership in 2011 and was stalled with the company’s promise to study the matter. RIM promised a resolution in January 2012 and I’ve been wondering if they were going to make the move, after their closed-door meeting in mid December. Mike Lazaridis, who co-founded RIM with Doug Fregin in 1984, has become Vice Chair of RIM’s Board and Chair of the Board’s new Innovation Committee. As Vice Chair, he will work closely with Mr. Heins to offer strategic counsel, provide a smooth transition and continue to promote the BlackBerry brand worldwide. Barbara Stymiest, who formerly served as a member of Royal Bank of Canada’s Group Executive and has been a member of RIM’s Board since 2007, has been named the independent Board Chair. John Richardson, formerly Lead Director, will remain on the Board. Prem Watsa, Chief Executive Officer of Fairfax Financial Holdings, also was named to the Board, expanding it to 11 members. An advanced messaging experience; innovative people-centric calendar and contact apps; and improved office productivity tools are some of the features in the PlayBook OS 2.0 upgrade. An advanced messaging experience with a powerful unified inbox. Announced during CES 2012, and expected to be available in February 2012, the free upgrade will enable customers to be even more connected and productive with heaps of new features. People-centric calendar and contact apps integrated with social networks. For an advanced messaging experience, a powerful unified inbox integrates with built-in messaging and social networking sites (Twitter, LinkedIn etc), as well as ‘tabbed email’ for managing multiple accounts. You can also compose and edit messages in rich text and manage you inbox with useful new tools (for setting out-of-office alerts, signatures etc). There are innovative people-centric calendar and contact apps that connects and feeds from your social network to make organising your day and getting in touch with people easy and fast. Enhnaced office productivity tools such as Word To Go & Print To Go. Remote control your PlayBook using your BlackBerry smartphone, especially if your PlayBook is connected to a TV via the HDMI output – perfect for watching movies or typing out notes. Revamped and improved productivity tools with new Documents To Go, and Print To Go application for wireless printing and enhanced browsing, plus much more.